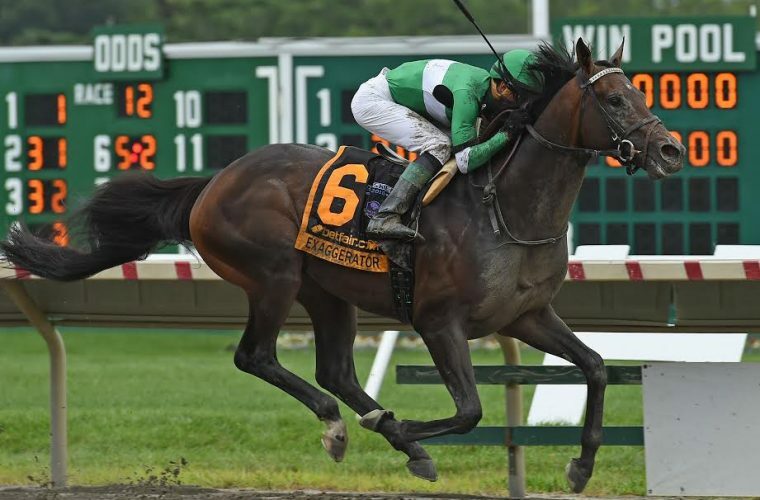 Exaggerator pulled through in a big way to win the (G1) Haskell Invitational at Monmouth Park on Sunday, July 31st. He broke last and settled well back early behind the field. Kent Desormeaux began making a move down the backstretch behind a quick pace of :22.78 and :46.62. He launched an aggressive four wide move to roll by the field like they were standing still and pulled away to win by 1 1/2 lengths. This race set up almost identical to the Preakness with the slop and all. Exaggerator earned a 101 Beyer and a 3 1/2 Ragizon, his lifetime top on the Ragozin sheets. $600,000 was added to his bankroll and this officially qualified him for the Breeders Cup Classic as it was a “Win and You’re In” Race. BSW Bloodstock acquired an interest in Exaggerator in February of 2016 on behalf of Head Of Plains Partners and Wachtel Stable. He went on to win the G1 Santa Anita Derby, afterwards a deal was brokered by BSW Bloodstock between managing owners Big Chief Racing and Rocker O Ranch and stallion buyers WinStar Farm, China Horse Club, and SF Bloodstock for the horse to stand stud at WinStar upon retirement. He went on to finish a great second in the G1 Kentucky Derby, win the G1 Preakness Stakes, and has now taken the G1 Haskell Invitational. This horse has taken us all on a fantastic ride! Exaggerator came out of the win in good order and arrived back at Saratoga in Keith Desormeaux’s barn. He will train towards the (G1) Travers Stakes on August 27th at Saratoga Racecourse.